Osteoarthritis (also called degenerative joint disease or osteoarthrosis) is the a progressive disease of the cartilage and most common form of arthritis. Cartilage is the tissue that cover the surface of bones in a joint. It allows bones to glide smoothly over each other for smooth joint movement and acts as a cushion that absorbs energy from physical movement. In osteoarthritis, this cartilage wears away, thus allowing the exposed bone to grind and rub against each other. This causes pain and swelling, as well as loss of motion of the joint. 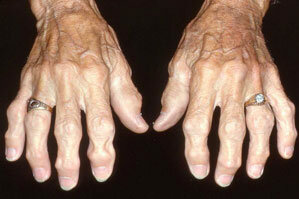 Hand affected by osteoarthritis. Notice the deformity of the finger bones. 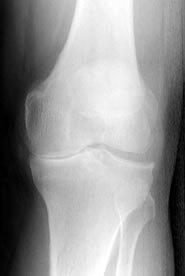 Knee affected by osteoarthritis. Notice the narrowed space in the joint between the bones. Over time, small abnormal bone growth in the edge of the joints called bone spurs or osteophytes can add to the loss of joint motion. These spurs can even break off and jam the joint space between the bones, causing even more pain and damage. 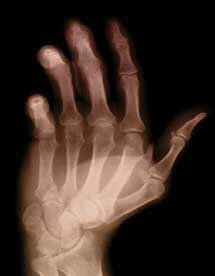 Unlike other forms of arthritis (there are about 100 distinct types), osteoarthritis does not affect internal organs. In a healthy jonit, the ends of the bones are covered by smooth cartilage tissue. The joint capsule is lined with synovial membrane and filled with synovial fluid that protect and lubricates the joint. In osteoarthritis, the cartilage is worn away and bone spurs may grow from the edge of the bones. Bone spur and cartilage fragments are often found in the synovial fluid. In some cases, the space between the bones in the joint narrows. In some people, the pain is more frequently felt in the morning when getting out of bed. The pain tends to be sporadic and temporary in early cases of osteoarthritis, and can develop to become persistent in advanced cases. The symptoms of osteoarthritis may worsen with physical activity. In finger osteoarthritis, Heberden's nodes or enlargement in the end joints of the fingers and Bouchard's nodes or enlargement in the middle joints are seen. Although in most cases they are not painful, they can develop suddenly and become inflamed, swollen, red, and painful in a condition called nodal osteoarthritis. Bone spurs in osteoarthritis of the spine can pinch or crowd spinal nerves that cause pain as well as weakness in the arms and legs. Osteoarthritis often affect the joints in the fingers and thumbs, neck and spine, as well as weight-bearing joints such as the hips, knees, and feet. In rare cases, it can also affect the elbow. Your doctor would check the patient's reflexes and muscle strength, and observe the affected joint. Physical tests such as the ability to walk and bend can also be done. X-rays can show the narrowing of the space between the bones in a joint, the presence of bone spurs, and hardening of the bones. Magnetic Resonance Imaging (MRI) and Computed Tomography (CT or CAT) Scan are non-invasive imaging techniques that can visualize the structures within the joint. These tests are done not to diagnose osteoarthritis, rather to disprove infection as the underlying cause of the symptoms. Bone becomes more brittle, more prone to damage and less able to heal with age. As people grow older, they are more likely to develop osteoarthritis. Women are more prone to developing osteoarthritis than men. Although not well understood, it is thought that the tendency to develop osteoarthritis may be genetically inherited. Because stress of the bone is increases with heavier body weight, obesity can contribute to the development of osteoarthritis, especially in weight-bearing joints such as the hips and knees. Major traumatic injury to the bone, such as a bone break can cause damage to the cartilage as well as improper alignment of bones in the joint. Microtrauma, such as repetitive motion of the fingers of a typist, can occur over a long time. These include: diabetes and endocrine disorders, metabolic diseases such as Paget disease and Wilson disease, congenital musculoskeletal abnormalities such as unequal leg length, as well as inflammatory diseases such as gout, rheumatic arthritis, and joint infection. Using orthoses or corrective devices, such as splints and braces to help correct joint alignments and provide more support to the body. Heat from hot soaks or warm wax (paraffin) application. Over-the-counter analgesic creams, such as those containing capsaicin, menthol and camphor. Over-the-counter medications, such as acetaminophen, nonsteroidal anti-inflammatory drugs (NSAIDs), such as aspirin, ibuprofen, and naproxen. Prescription medications, including COX-2 inhibitors. Note that recently, COX-2 inhibitors have been shown to increase the risk of heart attack and stroke. Replacement of the joint surface with metal or plastic. Fusion of the bony ends of the joint to prevent joint movement, and thus end the pain associated with motion. This surgery repairs the cartilage of the bone. In this surgery, the damaged knee or hip joints are replaced with an artificial joints. 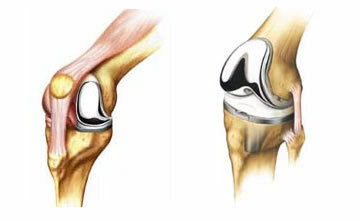 Partial and total joint replacement of the knee.